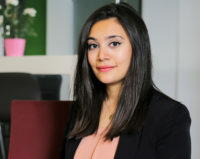 Doaa is currently an Operations Manager in Global Partners Governance (GPG), She is responsible for Egypt and Sudan projects monthly finance management, regular monthly financial reports, updating and re-allocating amounts in budgets and main point of contact on GPG Egypt office finance and external services. Also, she is responsible for all travel arrangements for Egypt and Sudan projects and first point of contact on visits and events organising, budgets and logistics arrangements and giving support to other projects when needed as well as coordinating task distribution for research and admin assistants in Egypt office. She is also responsible for liaising between Egypt and Jordan offices, and London Operations team to ensure policies and procedures are implemented consistently. The smooth running of GPG Egypt office is among her competencies along with some HR responsibilities with regards to Egypt staff. She joined Global Partners Governance (GPG) in June 2013 as an administrative assistant and became an office administrator in June 2014 then, GPG Egypt office manager in July 2015 and became a projects assistant in July 2016. Doaa holds a Bachelor’s degree in Oriental Languages, with specialization in Hebrew literature from faculty of Arts and Humanities, Helwan University, Egypt.